Chayote is one of the most nutrient-dense foods on the planet. It is known by different names in different cultures, for instance, it is called mirliton or pear squash in the USA, choko in Australia, sayote in the Philippines, pipinola in Hawaii, chuchu in Brazil, and tayota in the Dominican Republic. It is a member of the gourd family and looks like a green pear with coarse skin. When cut open, there is only one soft seed inside. “Chayote may not be as popular as other vegetables, but it actually has a very good track record when it comes to its health benefits. 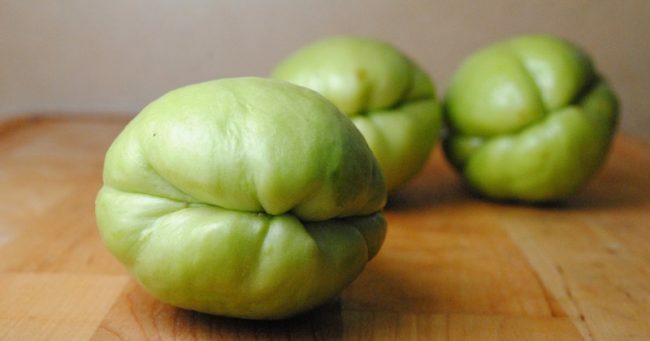 For starters, chayote contains no cholesterol and unhealthy fats and is usually recommended for controlling bad cholesterol levels and promoting healthy weight. Furthermore, chayote is a rich source of dietary fiber, magnesium, phosphorus, potassium, vitamin C and choline. Another strong suit of this vegetable is its folate content, which is helpful for cell division and DNA synthesis. Pregnant women can benefit from folate as well, as it helps inhibit neural tube defects among babies. Heart health: The high vitamin B content prevents the accumulation of homocysteine, which raises the risk of heart disease and stroke. Blood pressure: Chayote juice effectively lowers blood pressure. Leg cramps: Chayote is abundant in magnesium and potassium, so its consumption soothes leg cramps. Respiratory health: It improves respiratory and lung health, soothes a cough, treats cold, clears phlegm, and fights other respiratory issues. Bone strength: It is rich in vitamin K, so it boosts bone health and improves teeth structure. Thyroid gland health: It is rich n iodine and copper, both of which improve the function of the thyroid gland. Brain health: Its consumption will improve brain health, and boost your memory. Constipation: Being rich in fiber, chayote speeds up metabolism and promotes healthy bowel movements. Weight loss: The high manganese content converts fat and protein into energy, and helps the weight loss process. Skin health: Chayote is loaded with zinc, which prevents the breakout of acne, and balances hormones, enhancing the look of the skin. You can eat chayote raw, or add it to salads, cooked in soups and stews, or in juices. It has a mild taste that goes well with almost any fruits and vegetables. Note that the chayote skin might cause a tingling sensation when it comes to contact with the skin while cooking, but this effect lasts shortly and is nothing dangerous.